PHUKET: A man died yesterday (November 18) at Jungle Bungee Jump in Kathu after after he went fishing at Jungle Bungee Jump in Kathu – with 300 metres of power cable. 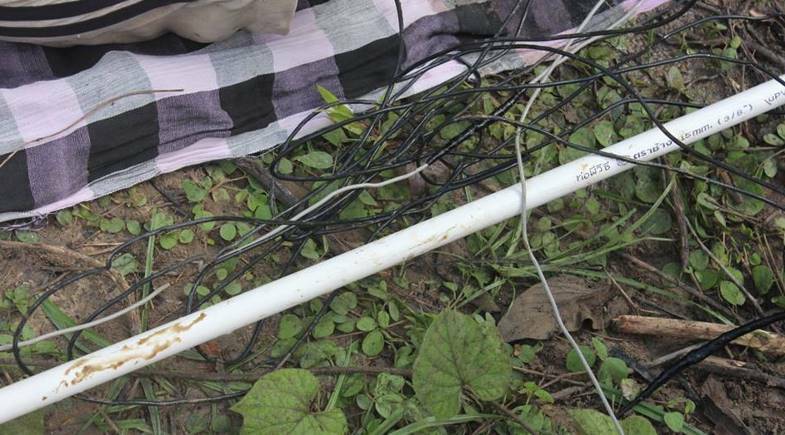 The 300 metre long wire which was found in the victim's hand. Suchart Chanaprasert, 36, from Nakorn Sri Thammarat, was found the following morning, floating in the pond face up. On his head was a small lamp and in his left hand was the 300-metre cable he had used to try and electrocute the fish. There was a large burn on his hand from where he was electrocuted. After questioning the victim’s relatives, police learned that Suchart had trespassed into the area to go fishing and had plugged the wire into the power outlet in the facility before heading to the pond to fish. Relatives, alarmed when he did not return, found him the following morning, surrounded by dead fish.